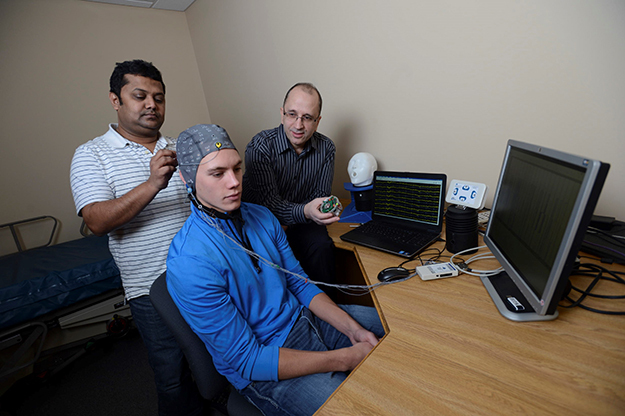 Ali Haider (left), a UND Ph.D. student in electrical engineering, adjusts a headpiece on Ben Johnson, a recent UND electrical engineering grad, for a Brain-Computer Interface project to assist people who have difficulty communicating because of disorders such as Lou Gehrig’s disease. UND Associate Professor of Electrical Engineering Reza Fazel-Rezai (far right) monitors the experiment. Photo by Jackie Lorentz. Imagine the ability to quantify concussion recovery in high school athletes, monitor the effectiveness of medication for Parkinson’s patients in rural areas, predict when someone with epilepsy will suffer a seizure, or even track treatment effectiveness for arthritis. They are also working on a brain-computer interface to control devices for people who can’t communicate, such as people with amyotrophic lateral sclerosis (ALS, or Lou Gehrig’s disease). Those are just a few of the projects that will be expanded as part of the new biomedical engineering graduate program, which begins accepting students this fall. It combines already strong areas in the UND College of Engineering & Mines, the UND School of Medicine & Health Sciences (SMHS), and the NDSU College of Engineering into a collaboration and research powerhouse that will offer new opportunities to students and faculty. 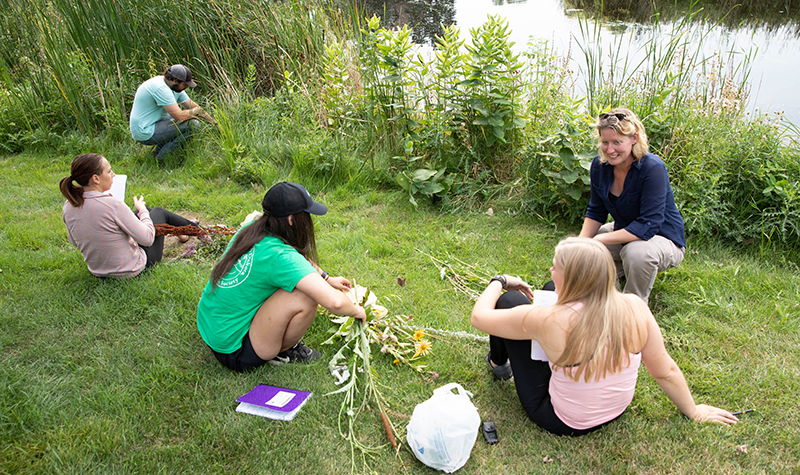 And faculty have already started working across disciplines to find solutions that serve the people of North Dakota. The two-year master’s and four-year doctoral programs begin this fall and will be offered on campus and online. A minor and focus in biomedical engineering are already in place for undergraduates. Job prospects are bright. “There is a lot of need for this,” said Fazel-Rezai, citing job outlooks from the U.S. Department of Labor, which project that employment in the field will grow by 23 percent by 2024, compared to 7 percent for all occupations. Graduates work in hospitals, research centers, universities, industry, and private companies and start their own companies as well. “There are hundreds of biomedical engineering companies in the Minneapolis metro area,” Fazel-Rezai said. 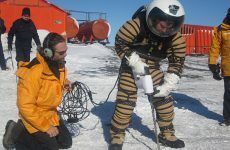 “This field has a direct impact on people’s lives,”Fazel-Razei said, citing ultrasound and magnetic resonance imaging (MRI), which were both developed through collaborations with engineers and healthcare researchers. 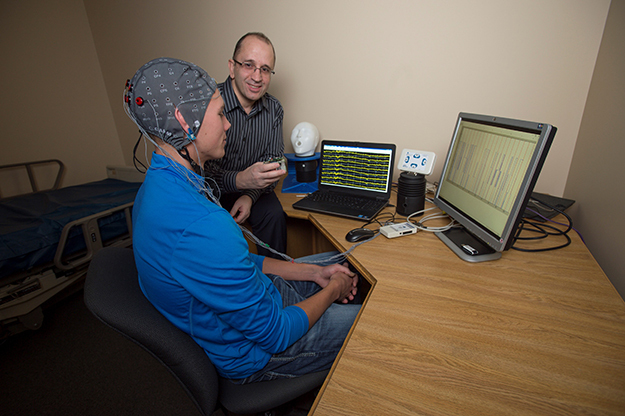 An innovative new UND-NDSU program, which combines the expertise of biomedicine and engineering research, is developing devices that may track signals in the brain and might detect seizures before they happen for people with epilepsy, among other projects. Photo by Jackie Lorentz. Projects include developing devices for people with epilepsy that track signals in the brain and may detect seizures before they happen. They are also working on a brain-computer interface to control devices for people who can’t communicate, such as people with amyotrophic lateral sclerosis (ALS, or Lou Gehrig’s disease). Combs and Fazel-Rezai are also working with Sanford Health and Jau-Shin Lou, professor and chair of neurology at the SMHS, to quantify the progression of Parkinson’s disease and explore the possibility of using sensors to help doctors prescribe the right dose of medicine. “We can send the device home with the patient, and physicians can prescribe at a distance,” Fazel-Rezai said. This especially benefits patients in rural areas. “This has the potential to be very innovative,” said Ruit. “A program like this enhances opportunities for students and scholarship. NDSU has strengths, and we have expertise at UND that complements that. It’s not duplicating NDSU’s work.” And, he said, a program like this will enhance the profile of both institutions.